WMCE: "After 35 years of playing together, Ilgi reveal no sign of their longevity, at least musically speaking." The originator of Latvian postfolk is in its prime. Since the group was founded, Ilģi has released 14 albums and one best of compilation. In 2006 “Ne uz vienu dienu” reached No. 2 on the World Music Charts Europe and remained a top ten album for four months, “Tur saulīte pērties gāja” debuted at No.4 on that same Chart in April 2012. The group will celebrate their 35th anniversary in 2016. Over the years Iļģi's traditional style gave way to fuller instrumentation and bolder arrangements. Violin, kokle and bagpipes blend with guitars, electric bass and drums to create a simultaneously ancient and contemporary sound, developed over the years by band members with diverse musical backgrounds. Iļģi has toured around the world. 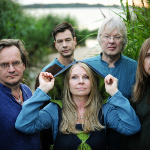 World music festival performances include: Trad-It, Posthof, Etnoplaneta, Rudolstadt, Suklegos, Viljandi, Chicago, Madison, Lotus and Globalquerque. In 2015 appearances are scheduled at events for the Latvian Presidency of the Council of the European Union in Riga, Madrid and Vienna, festivals throughout Latvia, as well as in Samarkand. The Latvian recording industry has awarded Iļģi Best Folk Album five times, most recently for Tur saulīte pērties gāja. Ilga Reizniece has received the Latvian Ministry of Culture's Grand Award in Folklore.